The product was good than expected. Has a little weight which is also good. Complete set. Nice and as shown, good material so we are satisfied. This combo a best of the storage and very helpful copper base product available. Its material is stainless steel and most durability so this is a best resourceful of kitchen. I like this product. Thanks naaptol. This copper base cook and serving set is really resourceful for every housewife. This kitchen essential has high durability. I am really happy with these kitchen essentials. I will surely recommend this to everyone. This combos is very helpful, kitchen storage and serving set. 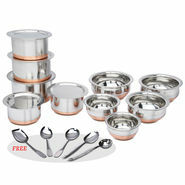 The 10 pcs copper bottom patila with lids and 5 pcs copper coated bottom handi are perfect for cooking and serving. When you have this durable cooking and serving set with you. So best offer provide naaptol. I LIKE THIS COPPER SET AND NAAPTOL SERVICE. THANKS NAAPTOL. NAAPTOL USE BLUE DART COURIER SYSTEM. THIS COURIER SERVICE SO NICE. I LIKE NAAPTOL ALL PRODUCT BUT WHEN NEW CUSTOMER JOIN TO CHOOSE NAAPTOL PRODUCT NAAPTOL CHARGE SHIPPING CHARGES 399. I THINK THIS CHARGES IS SO MUCH. I REQUEST NAAPTOL PLZ THIS CHARGES LESS DOWN. OTHERWISE I LIKE ALL PRODUCT TO NAAPTOL.